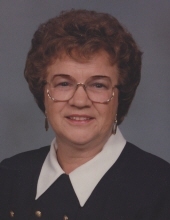 Lorraine Arlene (Hinderaker) Thompson Irvin Paxton, 84, long-time Jewell resident joined our Heavenly Father on December 1, 2018 at the Hubbard Iowa Care Center. Lorraine was born on March 22, 1934 to Amos and Minnie (Willig) Hinderaker of Radcliffe. She had three siblings: Richard, Dorothy, and Joyce (Hanson). Lorraine was baptized and confirmed at Bethany Lutheran church outside of Radcliffe. She graduated from Radcliffe High School. On February 15, 1953 she married the love of her life, Donald Wesley Thompson. This union blessed them with two children, Ricky Jay of Ames and Cynthia Renee Riedemann (Mark) of Jewell. Don and Lorraine were members of the Bethesda Lutheran Church in Jewell and farmed north of Ellsworth until Don’s death on Mother’s Day in May of 1975. In 1976 Lorraine began her 20-year career at the United States Post Office as a rural mail carrier in the Ellsworth and Radcliffe areas. On April 10, 1977 Lorraine married Lowell Howard Irvin. The two resided in Jewell until his death in 1992. In 1996 Lorraine married Jay Paxton until his passing in 2014. Lorraine enjoyed all types of sports including roller skating, bowling, and golf. As the wife of a farmer she helped care for animals, was a wonderful cook, spent many hours in the garden, and was a beautiful seamstress. She was a member of her neighborhood birthday club, the Advance Club, and actively served the Lord through various Bible study groups. Left to carry on Lorraine’s legacy is one sister Joyce of Windsor Manor, Nevada, Iowa, her children Rick (Mary Ann) and Cindy (Mark), her four grandchildren Lindsay, Courtney, Chad, and Austin and four great-grandchildren Max, Gavin, Kinley, and Olivia. Preceding Lorraine in death were her parents, three spouses, one brother and one sister. Lorraine will be remembered for her positive outlook, kind and gentle manner, and her love of Jesus. Blessed be the memory of Lorraine. To send flowers or a remembrance gift to the family of Lorraine Arlene (Hinderaker) Thompson Irvin Paxton, please visit our Tribute Store. "Email Address" would like to share the life celebration of Lorraine Arlene (Hinderaker) Thompson Irvin Paxton. Click on the "link" to go to share a favorite memory or leave a condolence message for the family.